Discover “Vegas cool” on a spirited trek through the Downtown Arts District — the hub of the local arts scene. This two-hour tour with an artist guide takes you to storefront galleries, nifty pop culture stores and vintage-Vegas antique shops. We’ll see some awesome public artworks and meet up with local artists who give the place its creative buzz. Along the way, we’ll sample some tasty bites at a local eatery and have a complimentary cocktail or brew at an urban lounge. 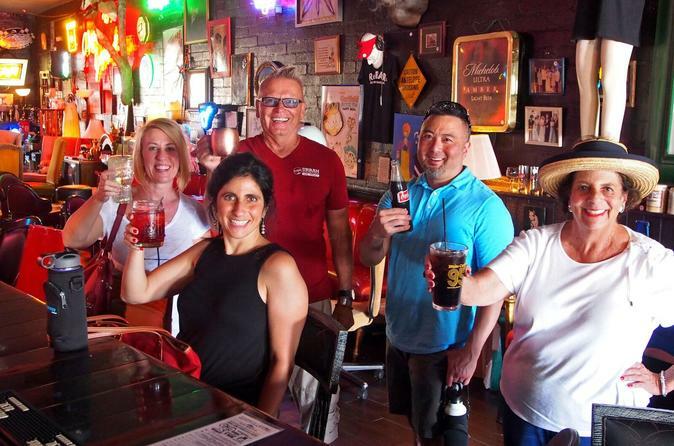 It’s a unique tour, off the beaten track, mixing highbrow/lowbrow arts with an inventive culture of libations and food—exactly what you would expect in a Las Vegas arts district! Your Las Vegas tour begins at a re-purposed industrial complex of 20 galleries in the heart of an 18-block neighborhood that’s in a flurry of redevelopment. See a few galleries and shops, as well as some cool spots for lunch. Get introduced to a hybrid-type tavern known as the 18b Urban Lounge. Visit the landmark building where the neighborhood was founded, check on the new arts trail from Fremont Street, visit the Burlesque Hall of Fame, and hear of plans to build a Las Vegas Art Museum nearby. Along the route, encounter neighborhood murals, stroll by the latest street art, stop by a pop culture sculpture that’s a favorite photo op, and catch sight of the quirky secret portrait of the legendary Las Vegas mayor who paved the way for this arts neighborhood. Your guide will give you the big picture and some neat little details about the neighborhood. Want to know the best place to get a cappuccino, a craft beer, or a Cornish pasty? He or she will point out the way. Want to buy a Steam Punk hat? He or she knows that, too. Finally, trek a block or so to a nearby antiques district developing along South Main. If you’ve ever wanted to be in the middle of a real vintage Vegas experience, this is it. Up and down the street are the best retro Vegas stores ever, many specializing in the mid-century modern era. You might see a classic restored neon sign or that look-a-like couch from the Brady Bunch or that Lucite dining room set you swear is from a James Bond movie. Look around and you’ll see more cozy bars and shops—everything from a retro beauty parlor to a yoga studio. It’s all happening on Main Street Las Vegas where “what’s old, is new again”—on an arts tour. Here’s a bonus, if you take this tour on the first Friday of the month, you can be part the biggest home-grown cultural block party in Downtown, known as First Friday in the Arts District. Special Offer - Book by October 22 to save 20% off our previously offered price! - Book Now!